We can clean most other types hard floor surfaces with this process such as vinyl and concrete floors. Over time your vinyl floor has a build-up of dirt and chemicals that does not get property cleaning with just mopping alone. Our process will thoroughly clean and rinse these types of floor to a like new condition. 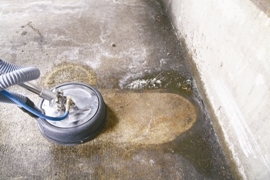 Garage floors are another area that should be cleaned on a regular basis. Dirt/debris from concrete flooring gets tracked in to your home, thus dirtying your carpet and other flooring types. Email us for a free estimate.